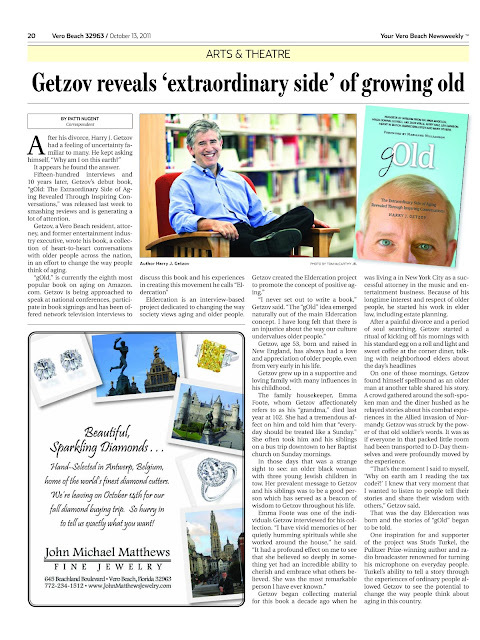 "Jewish Book Month Events on Tap at Jewish Community Center" - Springfield Republican / MassLive.com - (October 27, 2012 - Cory Urban) - Springfield, Massachusetts. 2012 IPPY Book Award - Bronze Medal (Aging Category) "gOLD: The Extraordinary Side of Aging Revealed Through Inspiring Conversations" - by Harry J. Getzov (Greenpoint Press) - Congratulations and sincere thanks to over 2,400 independent authors and publishers who participated in our 16th annual, 2012 Independent Publisher Book Awards contest. The awards ceremony to honor the medalists took place on June 4th in New York, on the eve of the Book Expo America convention. Vero Beach 32963 - October, 2011 - Vero Beach, Florida - "Getzov Reveals 'Extraordinary Side' of Growing Old"